Not to be confused with Surano. A Serrano in The Ballad of Gay Tony. 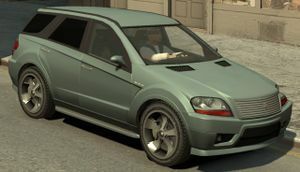 The Benefactor Serrano is a luxury crossover SUV in The Ballad of Gay Tony and Grand Theft Auto V.
The hood design, grille, greenhouse, and sides of the Serrano are similar to a Mercedes-Benz M Class W164; Mercedes-Benz GLK-Class influences are seen on the crease on the sides, the rear, and the front bumper somewhat; the headlights are much like a 2004-2006 Volkswagen Touareg but with added turning signals. The engine badge on the side reads V12, just like the one on the Schafter. Interior is similar to Habanero's, but steering wheel bears Benefactor logo instead of Albany's or Emperor's. The "Serrano" name is presumably based on that of the Porsche Cayenne as both cars take their names from chili peppers, similar to the Habanero. The Serrano's name could also be a reference to the name of the Nissan Terrano, although there are barely any similarities between the two. Standard version which has the same, but slightly altered rims with the Emperor Habanero. Sport Version which has tinted windows, larger front and rear bumpers, a custom chrome grill with a large Benefactor emblem in the middle, resembling a Mercedes-Benz ML63 AMG grill, and custom alloy wheels similar to Banshee's but now in wider range of colors. A Serrano is shown in the first trailer for GTA V, appearing mostly unchanged from The Ballad of Gay Tony. A regular Serrano in TBOGT (Rear quarter view). Modified variant of the Serrano in TBOGT (Rear quarter view). A Serrano in the first GTA V trailer. A Serrano in GTA V (Rear quarter view). With a supercharged V12 engine, the Serrano excels considerably well in power, possessing above average acceleration and a good top speed of 211 mph (340 km/h). With a four-wheel-drive system and a more than sufficient amount of torque, the Serrano is also capable of hillclimbing, although its low-riding body design, like that of the Habanero, makes it less compatible for off-roading. In terms of steering and braking, the Serrano's performance is average due to its excess weight, and will occasionally burn out in tight corners due to its torque. Although the Serrano and the Huntley Sport compete for the fastest SUV, the Serrano is considered to be better because it has a better acceleration (0-60 mph in 5.4 seconds) while the Huntley Sport's acceleration (0-60 mph in 6.5 seconds). The modified Serrano is only different in appearance, having the exact same handling as the normal Serrano. As it is a high-end vehicle, it will spawn in more affluent areas, such as Star Junction. In the mission Corner Kids, Luis, Armando and Henrique must escape from a swarm of LCPD officers; during which they immediately head straight to a Serrano parked in East Hook of Broker. The Serrano will spawn in multiplayer. Easily acquirable by phoning up Henrique Bardas and asking him to steal one for you, after completing I luv LC. In The Ballad of Gay Tony, the default radio station for the Serrano is San Juan Sounds. In the Rockstar game Max Payne 3 one of the antagonists is a Brazilian criminal named Serrano. This page was last modified on 17 June 2015, at 04:16.